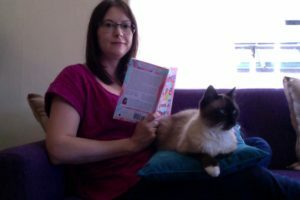 I rarely feel comfortable out in the world, so I’m fairly uncompromising when it comes to my own space, whether that’s page space or living space. 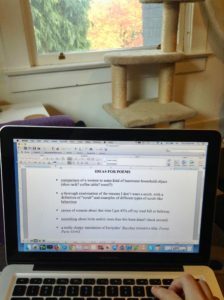 Besides being a person who writes something once or twice a year, I mostly work from home, so I’m here a lot, sitting behind my laptop screen for a bunch of hours most days. 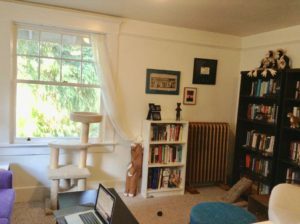 For my first couple years in this suite I didn’t have a desk, so working and writing on one of the mismatched, ergonomically unadvisable armchairs in the living room was the only option. 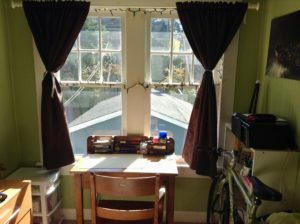 Then a friend kindly donated her desk in the summer before I started my MFA, and I set it up in front of the windows in the little recessed nook at the back of my bedroom, thinking, Boy, I’m sure going to be getting a lot more done and taking myself a lot more seriously now that I have a Writing Space™! It really is a lovely spot (I mean, look at it! 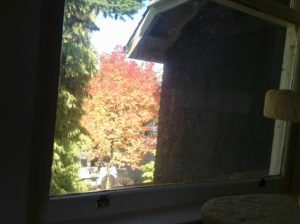 ), and I do work in there sometimes, but I still prefer the living room, for a bunch of reasons. Most of my books are in here. (Digression: I realize I could save money by using the library, and save space by using an e-reader, but I’ve tried both and it’s just not the same. I like having books, I like being around them. They feel different when they’re physical and when they’re mine. I don’t know if I could write in a bookless room, and hopefully I’ll never find out.) My random knickknacks are in here, the fridge and junk food cupboard are in my sightline and the trip to refill my coffee mug is a few steps shorter, the temperature and the light are less intense in the afternoons, there’s a tree right in front of the window that I’m obsessed with in the fall (it turns into this whole crazy translucent red and orange situation)… I’ve also redecorated recently, and the thrill of having a living room full of furniture I actually chose hasn’t worn off yet. This room is organized chaos; my novels and poetry are alphabetized, my books from my past life as a future classicist (R.I.P. Former Meaghan, 1997-2007) are arranged chronologically and by genre, I vacuum pretty much every day, but the shelves and walls are covered in all kinds of disparate crap, and the couch is purple, and the floor is covered in cat toys. A lot of the things I write work in a similar way: they’re collages of sometimes contradictory parts that, gods willing, come across as a weirdly unified whole if you back up far enough. 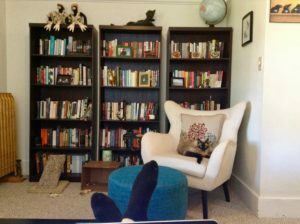 Ultimately, I feel most like myself on the couch with my feet propped on the coffee table and my fiction shelves in front of me and one or both of my cats passed out next to me than sat at a desk—even if it is a cute little desk in a cute little nook. For the most part, I really don’t want to take myself seriously.